Translating genomics: are we connecting the dots? 'Mode 2' knowledge production and massively collaborative distributed science: letting the 'academic genie' out of the ivory tower? Translation of pharmacogenomics to public health action is at the epicenter of the life sciences agenda. Post-genomics knowledge is simultaneously co-produced at multiple scales and locales by scientists, crowd-sourcing and biological citizens. The latter are entrepreneurial citizens who are autonomous, self-governing and increasingly conceptualizing themselves in biological terms, ostensibly taking responsibility for their own health, and engaging in patient advocacy and health activism. By studying these heterogeneous 'scientific cultures', we can locate innovative parameters of collective action to move pharmacogenomics to practice (personalized therapeutics). To this end, we reconceptualize knowledge-based innovation as a complex ecosystem comprising 'actors' and 'narrators'. For robust knowledge translation, we require a nested post-genomics technology governance system composed of first-order narrators (for example, social scientists, philosophers, bioethicists) situated at arm's length from innovation actors (for example, pharmacogenomics scientists). Yet, second-order narrators (for example, an independent and possibly crowd-funded think-tank of citizen scholars, marginalized groups and knowledge end-users) are crucial to prevent first-order narrators from gaining excessive power that can be misused in the course of steering innovations. To operate such 'self-calibrating' and nested innovation ecosystems, we introduce the concept of 'wiki-governance' to enable mutual and iterative learning among innovation actors and first- and second-order narrators. Translation of pharmacogenomics to public health action has been at the epicenter of the life sciences research and development (R&D) agenda since the completion of the Human Genome Project (HGP) a decade ago. In the current post-HGP ('post-genomics') era, the interconnectedness of biotechnology designers, innovators and consumers of scientific knowledge might appear too obvious a need to mention. After all, why design and innovate a product (for example, a pharmacogenomics test) if it were not to meet the needs of the attendant users? The southern African concept of ubuntu epitomizes the mutual interdependency of human beings, be they scientists or citizens, and the message that 'no person is an island' . One would think the spirit of ubuntu is already well-established among the expert communities that comprise the post-genomics innovation ecosystem. But experts, by virtue of disciplinary hyper-specialization that is endemic in the post-genomics era, suffer from professional blind spots [1, 3, 4]. Such siloed knowledge is a barrier to putting genomics to action. Nearly a century ago, Thorstein Veblen noted 'trained incapacity', referring to acquired blind spots in professions or 'learned inability' to maintain a collateral vision due to extensive specialist training . Recent studies support Veblen's theory. For example, a scoping analysis of 344 studies in health and allied sciences addressing patients', clinicians' and researchers' priorities for research found that only nine considered the extent to which questions posed by researchers match questions of relevance to patients and clinicians [5, 6]. Contributions by Veblen and other scholars [4, 7–14] have collectively underscored the risks associated with claiming a 'card-carrying' member status within one's own field or profession, be it public health, pharmacology, genetics, industry, government, social science, bioethics or moral philosophy. The risks include an 'echo chamber effect', where one communicates primarily with those who are members of the same disciplinary culture, or think through the same disciplinary lens. This interferes with transdisciplinary synthesis of scientific evidence and can perpetuate or augment the existing knowledge silos in genome medicine [13, 15]. In addition to professional blind spots in science, previous discussions of genomics have exposed otherwise unchecked and embedded self-interests, whether from academia, government, industry, media or patient advocacy groups, not to mention bioethicists, social scientists and philosophers reflecting on genomics, innovation and society. Scientists and technology-driven expert communities tend to advocate, for example, that 'more research is needed', but policymakers and patient advocacy groups need to act when 'facts are uncertain and stakes are high' (for an excellent overview of the tensions between and opportunities for better cooperation between scientists and policymakers in the face of scientific uncertainties, see the discussion by Bernard Choi et al. and Jerome Ravetz ). Our working premise is that to truly enable a robust public health pharmacogenomics R&D landscape, post-genomics science warrants a 'third pillar' whereby the political determinants of health are recognized and taken seriously, as much as the social and biological determinants of health [19–23]. This paper introduces, first, the concept and project of 'Mode 2' knowledge production that typifies post-genomics R&D to a large extent [22, 24–27]. It is applied and collective innovation-oriented, and co-produced in multiple scales and at multiple locales, both inside and outside academia. This is contrasted with 'Mode 1' knowledge production, which is narrowly framed, often confined to academia, and has the ethos of 'knowledge for its own sake'. We provide examples of Mode 2 knowledge in pharmacogenomics, such as citizen science, and discuss the implications for post-genomics science. By studying different modes of knowledge production in the post-genomics innovation ecosystem, innovative parameters of collective action can be defined so as to move large-scale data-intensive science such as pharmacogenomics into public health practice. Second, we discuss knowledge-based innovation as a complex ecosystem composed of innovators ('actors') and regulators ('narrators'). This idea is based on the tenet that one cannot critically examine, in a singularly disinterested manner, the very innovation system in which one is embedded as an innovation actor (for example, a principal investigator conducting a pharmacogenomics project) [21–23]. To achieve robust translation of pharmacogenomics to public health action, we propose a nested post-genomics knowledge governance system composed of first-order narrators (for example, social scientists, philosophers and bioethicists cognizant of technology nuances) situated at arm's length from innovation actors. Yet, second-order narrators (for example, an independent, possibly crowd-funded think-tank alliance of citizen scholars) are also crucial to improve self-calibration and accountability in a post-genomics knowledge ecosystem. Third, to illustrate knowledge-based innovation as a complex ecosystem, we propose a Web 2.0-driven 'wiki-governance' approach that goes beyond traditional public engagement or citizen participation models to close the gap between research participants and researchers by giving participants and publics the ability to collaborate in pharmacogenomics governance. Pharmacogenomics is now an old science. With the introduction of genomics science and technology over the past two decades, it has evolved from the predecessor field of pharmacogenetics that has mid-20th century origins in early studies of monogenic variations in drug metabolism. Yet progress in pharmacogenomics science is neither driven nor influenced by technology alone. In the current post-genomics era, there have been seismic shifts in the way scientific knowledge is produced. Evidenced by various open science initiatives connected by digital media and Web 2.0, post-genomics knowledge is co-produced in a highly distributed manner. It is extending well beyond the cloistered halls of academia and the laboratory bench space to hitherto unprecedented locales. It impacts, and is being impacted by, new stakeholders such as citizen scientists, developing countries and patient advocacy groups [3, 16, 17]. These stakeholders are contributing, in some cases, to complex scientific tasks . how is knowledge produced, validated, negotiated, made sense of and enacted in local settings? How is knowledge translated across locations? How does knowledge travel or get translated across organizational boundaries and epistemologies (that is, ways of knowing: how do we know what we know)? Taking such a dynamic and variegated view of knowledge generation is increasingly important in an age where social media-type technologies enable the emergence of global online communities, support knowledge reuse and remixing, and afford the emergence of generative and massively open forms of collaboration. This resonates well with Michael Gibbons and colleagues' concept and project of 'Mode 2' knowledge production [24–27]. Mode 2 knowledge is a simultaneous 'co-production' by a multitude of heterogeneous actors, both experts and non-experts/non-professionals, dispersed in diverse geographical and disciplinary locales and scales. Mode 2, as explained by Barbara Prainsack, is 'where knowledge production takes place inside and outside of organisations and institutions that have ceased to fit within any clear categories' . The concept firmly recognizes the 'social construction' of scientific knowledge and that the boundaries between science, technology and society are highly porous. That is, scientific knowledge is a co-product of technology and natural laws, as well as human values and epistemologies embedded in scientific inquiry. This contrasts sharply with the scientific practices of the original founders of pharmacogenetics in the 1950s, where knowledge was produced within the secluded territory of academia using a 'single-scientist, single-project' model rather than collective innovation and massively collaborative distributed science (Table 1). Mode 2 knowledge production is not without its critics, particularly traditional experts, academics and technology-centered communities who are not necessarily ready to let the 'knowledge production genie' out of the academic ivory tower, that is, from their power domains and controlled territories (for a detailed discussion of this tension in Mode 2 knowledge between scientists and non-expert communities, see the excellent overview by Gibbons et al. ). Yet, while there are limits to the extent to which non-experts and non-professionals may contribute to scientific inquiry, it is clear that their role is not relegated to the traditional passive one where they are simply asked to adopt and accept the innovations produced single-handedly by experts . For pharmacogenomics R&D to be robustly linked to public health action on the ground, we need to recognize that the entire scientific trajectory is open to influences by social systems and human values that remain unchecked in discourses around knowledge-based innovation. The choice and framing of scientific hypotheses, experimental methodology and interpretation of data can all be influenced by experts' and their institutions' embedded value systems that are not always made explicit [30–33]. Hence, Mode 2 is not a departure from pure knowledge production as such, but an attempt to make the politics of knowledge and the embedded human values and motives transparent and, thus, render knowledge production more robust, actionable and stand the test of extended peer-review by a broader diversity of stakeholders. In a sense, Mode 2 is not new because the boundaries between natural/technical and social systems are highly porous, and have always been (see the excellent autobiographical account on this subject by Brian Wynne ). Yet, Mode 2 is novel for offering a coherent explanation for how human values and ways of knowing expressly impact what gets to be produced as scientific knowledge . As science and knowledge production have become more dispersed with new actors such as citizen scientists or practices such as crowd-sourcing and direct-to-consumer genetic testing, Mode 2 has merged with another emerging post-genomics characteristic: biological citizens. These are entrepreneurial citizens who are autonomous, self-governing and increasingly conceptualizing themselves in biological terms and ostensibly taking responsibility for their own health. Biological citizenship is also accompanied with the rise of patient advocacy and health activism [34, 35]. Together with opening up previously untouchable domains of scientific enterprise, Mode 2 knowledge symbolizes an ongoing experiment that will be further shaped in ways that are currently unpredictable by the intersections and divergences of technical, social and economic vectors and biological citizenship. Still, one thing is certain: there is much to be gained in reducing research waste  by more closely engaging expert communities, non-professionals and end-users through recognition of Mode 2 knowledge production processes and concepts. There is a large translation gap in moving genomics technology and basic science discoveries to successful innovation. Muin J Khoury and colleagues  found that only 3% of the US National Institutes of Health (NIH) funding was targeted for downstream translational research. The study did not examine other funding sources or clinical implementation taking place under a variety of mechanisms, including traditional clinical practice, quality and safety initiatives or research. Nonetheless, this finding is important as it points to the small fraction of resources dedicated to translational research compared with basic science . Further investments in translational research and recognition of the role to be played by Mode 2 knowledge in linking basic research to public health practice may remedy this translation gap in genome medicine. The recent NIH initiative to establish the National Center for Advancing Translational Sciences (NCATS) to pursue opportunities for disruptive translational innovation is consistent with Mode 2 genomic knowledge production . While Mode 2 knowledge articulates a new lens to examine and understand post-genomics knowledge production, it does not necessarily embody a 'systems orientation' to innovation. We claim that there is a need to complement and further advance the Mode 2 concept by rethinking post-genomics public health as 'knowledge ecologies' that collectively form an innovation ecosystem. There are compelling reasons why such an ecosystem approach is important for public health pharmacogenomics action on the ground. First, the multiplicity of actors that enables innovations in the emerging field of public health pharmacogenomics demands coordination and steering capabilities for the entire knowledge ecosystem that underpin and sustain such innovation. Second, it would be naive to assume that innovation actors invariably share complementary or mutually compatible aspirations and aims. Nor can one assume that these motives are immediately made transparent to others. The ethos of advocacy ('change management', or bringing about a change for public health action) is not often cultivated within traditional academic or scientific expert communities, let alone in the course of training as a graduate student in pharmacogenomics. Third, complex collaboration is needed when knowledge crosses organizational, disciplinary or national boundaries, and when actors have differences in research practices and methods, ontologies, human values and epistemologies [10, 11, 13]. Fourth, there is an increasing recognition that knowledge-based post-genomics innovations demand cultivation of ongoing, iterative and mutual learning among the innovation actors so as to enable dynamic and sustainable collective innovation . These considerations together raise collective action problems as well as opportunities to scale up genomics for applications in public health . Traditional modes of knowledge sharing and learning practices among experts, such as annual international meetings and traditional experts-driven peer-review processes, are not always well equipped to translate pharmacogenomics to public action on the ground. Without a steering function, innovations can be stifled or result in redundant research and duplication or waste. A new theoretical lens is required to conceptualize knowledge-based innovation as a complex ecosystem of 'innovation actors' and 'innovation narrators'. Actors often (and ought to) have self-interests that limit their ability to evaluate the very innovation ecosystem in which they are embedded. On the other hand, it would be naive to place narrators automatically 'above the fray' and think that they will have no self-interests. As with philanthropists, government research funders, academics, industry or the media, first-order narrators also may have self-interests that need to be made explicit. For example, while moral philosophers, bioethicists and social scientists have taken up the task of social critique and study of the social construction of science and technology, their normative conclusions (for example, an ethical/unethical technology, person, industry), as with natural scientists, can also be subject to influences by their own value systems and personal career agendas [19, 21–23]. One of the unique aspects of the Human Genome Project, in contrast to traditional discipline-bound sciences such as pharmacology, was the intentional funding of research into the attendant ethical, legal and social issues (ELSIs) - a research mandate that continues to the present day in that all research proposals submitted to the US National Human Genome Research Institute must include activities in the ELSI space. While there is no doubt that these efforts remain crucial, and have moved genomics R&D increasingly to the Mode 2 knowledge space (relative to pharmacology, for example), there is growing debate within the ELSI community where the next direction(s) should be [12, 39–42]. It is noteworthy that pharmacogenomics is a 'hybrid' field that draws from both genomics and pharmacology. While genomics now resides within the Mode 2 space, pharmacology as a discipline has lagged behind. For example, pharmacology research does not routinely carry out ELSI research as a contrast to genomics R&D. Indeed, if we reflect on the panoply of contemporary biomedical disciplines in existence, social pharmacology is 'missing' or kept silent, and sadly does not exist as a formal university department, despite the legitimate recognition of social medicine or social psychiatry in 21st century universities. This is an important gap that is impacting pharmacogenomics as a hybrid science that rests in part on pharmacology scholarship. Hence, second-order narrators (for example, an independent and possibly crowd-funded think-tank alliance of citizen scholars, representatives of hitherto marginalized groups, and knowledge end-users engaged in public scholarship) are crucial  to prevent first-order narrators from gaining undue excessive power that can be potentially abused or incorrectly targeted in the course of steering innovations. Figure 1 illustrates our proposed conceptual model of a post-genomics innovation ecosystem and its elements. Rethinking knowledge-based innovations as being composed of actors and narrators. In a knowledge ecosystem such as public health pharmacogenomics, innovation actors co-produce knowledge and calibrate their actions and trajectory through open and transparent mutual learning, enabled by recursive practices such as wiki-governance. First-order narrators, who are situated at a crucial but not imperceptible analytical distance from the innovation actors, can examine and steer the innovation ecosystem trajectory, thereby contributing to collective action in the innovation ecosystem. 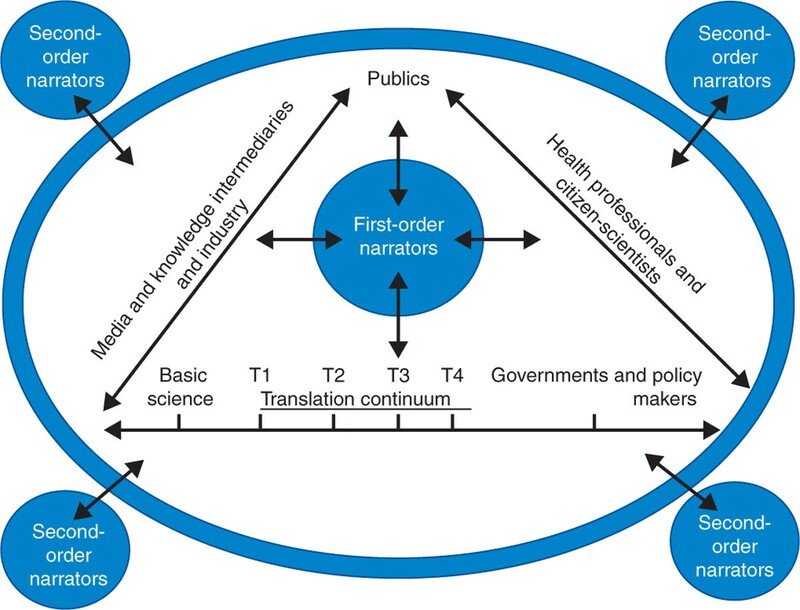 Second-order narrators (for example, innovation observatories represented by citizen scholars, hitherto marginalized groups, and patients) can further keep the first-order narrators in check by making them more accountable, and by rendering visible their actions and situating them in a socio-technical context. Definitions: phase 1 translation (T1) aims to advance a basic genome-based discovery into a candidate health application (for example, a pharmacogenomics test); phase 2 translation (T2) concerns the development of evidence-based guidelines for a pharmacogenomics application; phase 3 translation (T3) aims to connect evidence-based guidelines with health practice, through delivery, dissemination and diffusion research; phase 4 translation (T4) evaluates the real world health outcomes of a pharmacogenomic application. See Khoury et al. for the T1 to T4 translation research continuum and its actors. Undoubtedly, the type and range of actors to be included in such an ecosystem are diverse. The examples shown are intended to provide an initial conceptual sample of the possible constituents and their juxtaposition to the innovation narrators of the first and second orders. In the next section, we introduce a new but related concept: 'wiki-governance'. We situate it within the broader framework of citizen participation in open science so as to concretely define the ways in which the innovation ecosystem constituents, as well as knowledge co-production, can be governed in the spirit of Mode 2 distributed science. Building on developments in agricultural biotechnology and nanotechnology in the 1990s and 2000s, genomics research has made great strides in incorporating public support to close a perceived 'agency gap' between researchers and research participants and the greater citizenry. This evolution, witnessed in forums such as citizen juries and consensus conferences, is viewed positively in academic circles for substantive, normative and instrumental reasons alike [42, 43]. It has also been observed empirically that a diversity of publics desires a role in developing science and technology policy, if not merely an offering of general acceptance of a research project or domain [44, 45]. Models of science and technology public engagement have burgeoned in the past two decades, though to fully understand their underpinnings one must situate them in the larger historical context of social and democratic theory, political science and governance studies. At the same time, a word of caution is necessary: applying 'democracy' to post-genomics R&D may raise false expectations about binding political norms. The concept of public or citizen 'participation' (or better, 'collaboration'), on the other hand, achieves a more suitable framework for positioning public engagement in post-genomics governance and innovations. The idea of multiple levels of citizen participation in decision-making can be traced back, at least in modern (and Western) times, to Sherry Arnstein's influential 1969 article on the eight levels of citizen participation, ranging categorically from 'nonparticipation' to 'tokenism' to 'citizen power' . More recently, publicly funded research agencies are engaging in open science as noted above , and in the spirit of transparency, state and municipal governments around the world are implementing open data strategies whereby government-collected data are distributed online openly so that publics can take the data to either monitor government effectiveness or brainstorm about creating new ways to make public services more user-friendly, more efficient and more interactive. Many state governments, such as New Zealand, Estonia, Russia and Brazil, are also moving past deliberative democracy to 'participatory democracy', creating 'e-democracy' forums whereby publics can initiate legislative proposals, participate in public hearings, or draft bills - as New Zealand's wiki-drafted Policing Act 2008 demonstrates . Another example of the larger context of public engagement is the concept of 'upstream engagement', seen especially in science and technology fields such as nanotechnology, where publics are included at the embryonic agenda-setting stages of policymaking so as to remedy the epistemic and communicative estrangement between putative experts and lay publics and encourage more dialogue, co-production of knowledge and, ultimately, collaboratively crafted outputs . All of these examples work towards 'empowering' individuals to harness their various skills to achieve collective innovation. However, some models of public engagement, albeit laudable, seem to assume a passively consumptive public that can only digest information unidirectionally disseminated (for example, posting of policies on a website). Other models may involve so-called public 'community members' (for example, town-hall-style panels), but in fact may be what Arnstein would label 'placation' and a symbol of tokenism  - that is, a facade of inclusiveness that in reality merely acts to legitimate the decisions of science experts. Indeed, some authors have found that (democratic) deliberation, as the name implies, focuses on inputs without any guarantee of collaborative outputs. Political science analyses indicate that public communication and public consultation resembles more a monologue than dialogue, and even in situations of bidirectional public participation, there is no guarantee of actionable steps beyond processes (for example, gathering diverse viewpoints), especially for the creation of innovative implementable solutions [49, 50]. Thus, there is a large potential for the greater citizenry to be lulled into a false reassurance of a remedied 'agency gap' or a responsible and representative science and science policymaking agenda. This potential certainly is nestled in the post-genomics field, where so much of the funding comes from taxpayer-endowed public (state) entities, yet experience and expertise increasingly lay with decentered, non-state actors . Loss of public trust and support would be detrimental to post-genomics research in general and would also stall its translation to successful innovations . In light of our proposed innovation and knowledge ecosystem to put public health pharmacogenomics into action, one model that may overcome some of these pitfalls and offer a better avenue for translating pharmacogenomics to public health action is 'wiki-governance', which horizontalizes the traditional decision-making hierarchy and situates itself within a more globally networked and mutuality-driven innovation ecosystem (Table 2) [53, 54]. Importantly, wiki-governance grafts the social and political science fields onto the genomics infrastructure by giving publics the ability to shape the innovation trajectory directly and collaboratively. Wiki-governance may be especially useful in biobanks, which are crucial for public health pharmacogenomics. While no biobanks have yet fully adopted the model, several have embraced variations of it, including the reflexive governance approach of the UK Biobank  and the adaptive governance approach of the (Canadian) BC Generations Project . Post-genomics R&D is increasingly conducted with and initiated from biobanks, not only in basic sciences, but also in epidemiology surveillance where large-scale datasets (as in biobanks) can concretely inform R&D. In biobanks, a full embrace of the model to accelerate the nascent field of public health pharmacogenomics would entail managers and administrators ('biobank builders') developing a secure online forum where publics could register and collaborate in proposing, drafting, commenting on, and amending biobank governance structures, protocols, strategies and policies. One of the main distinguishing features of wiki-governance is not only its embrace of social media-driven technology, but also the use of structured coordination via issue framing and role differentiation so that individuals can choose the opportunities that best exploit their skills and represent their interests. For example, some individuals may have niche expertise in legal areas such as intellectual property, and thus may want to comment on or draft a biobank policy on commercialization or benefit sharing, whereas other individuals may have a background or interest in genetics or bioethics and decide to focus only on those particular areas. Wiki-governance applications generally do not adhere to a completely libertarian approach. In the example of biobanks, the biobank's management (or similar) committee would act as final arbiters in determining if and when a structure, policy or protocol should be adopted as final, and whether its contents are scientifically, ethically and legally valid. Moreover, the model is flexible in that a continuous feedback loop is employed so that as significant science, technology and socio-legal developments arise, publics can challenge the existing policies and procedures and help anticipate and shape future ones. In sum, wiki-governance expands the innovation actors' collective capacity to imagine and respond to multiple possible (multiplex) future(s) of a given novel innovation trajectory such as public health pharmacogenomics. Some potential but not insurmountable drawbacks of wiki-governance have been noted elsewhere (for example, scaling and capital investment difficulties, the so-called digital divide, difficulties associated with drafting normative rather than factual policies) . Some have suggested that collaboration with publics will retard rather than accelerate innovations and that lack of putative expertise, consensus on certain values and interests, as well as potential marginalization of certain groups of citizens, could limit the practicality of true public engagement . Yet, a compelling case can be made for the need for pooling diverse knowledge and skills in the backdrop of Web 2.0 and social media technology. As Andy Stirling notes, traditional linear notions of technological progress hide 'the ways important political choices over alternative directions for innovation are made at every juncture - and should be as subject as other areas of policy, to democratic participation and accountability' . Stirling argues that publics 'can be seen to offer means to reconcile tensions between the otherwise-estranged Enlightenment values of science and democracy' and offer 'an opportunity to be more rigorous about the uncertainties in bioscience innovation and more accountable about the exercise of power' . In post-genomics and related new specialties such as public health pharmacogenomics, where uncertainty is paramount and much knowledge remains unknown or indeterminate, models such as wiki-governance can effectively bridge science and democracy to achieve multiple pathways for citizens to rightfully envision themselves as co-creators of genomic science, policy, and successful and sustainable innovation. Every first order action has second order consequences. With the rise of Mode 2, long-held assumptions of scientists and science are being challenged in the post-genomics era - what it means to be a pharmacogenomics expert or a university professor, whether science and innovation can be singularly entrusted or simply delegated to first-order traditional innovation narrators such as social scientists, philosophers or bioethicists, and whether academia, industry or governments can continue to exclude non-professionals . Indeed, the idea of improving genomics translation for public health action, while important and essential, has hitherto bracketed out the emerging ways in which post-genomics knowledge is co-produced by a multitude of stakeholders. We suggest that these choices are pressuring public health and pharmacogenomics practices outside universities as well, for example, in regulatory agencies, governments, transnational organizations, think-tanks and non-governmental organizations, and the life sciences, biotechnology and insurance industries. The present analysis of the emerging field of public health pharmacogenomics is an invitation to think outside our own professional habitus and hold judgment upon encounters with new ways of knowledge production. Ultimately, Mode 2 moves us to build the missing third pillar in positivist post-Renaissance science by bringing to the fore the political determinants of health, together with the attendant social and biological determinants. As we move from a Mode 1 Edisonian science, where data collection and experimental design by a single principal investigator were essential loci of the scientific endeavor, to Mode 2 distributed science, where data collection is automated by next-generation sequencing technologies and increased connectivity among innovation actors, there is an essential need to understand the new ways of doing pharmacogenomics science that enable collective innovation for public health action . The analysis, concepts and work reported herein were supported by the following grants to the authors: a research grant from the Social Sciences and Humanities Research Council (231644) on anticipatory technology governance and OMICS biotechnology foresight (VÖ); Canada Research Chair in Technology, Management & Healthcare (SAF); the National Science Foundation, Division of Biological Infrastructure award 0969929 (EK), National Institute of Diabetes and Digestive and Kidney Diseases of the National Institutes of Health under awards U01-DK-089571 and U01-DK-072473 (EK), The Robert B McMillen Foundation Award and The Gordon and Betty Moore Foundation (EK). The present paper was in part prepared during a visit (VÖ) to the Foundation for Genomics and Population Health, Cambridge, UK in June 2012. In addition, insightful and spirited conversations with Nuriye Bilici and Sakine Korkmaz (Cihangir, Istanbul, Turkey), Hesther Tims (Amsterdam, Netherlands), Milu Neves-Pereira (Inverness, UK) and Ron Zimmern (Cambridge, UK) on the concepts of reflexivity and modernity  provided the inspiration and helped nuance the discussion in the present paper. The views expressed in this article are the personal opinions of the authors and do not necessarily represent the positions of their affiliated institutions or the funding agencies.